Sebastian Vettel won the race, which was affected by two Safety Cars, to extend his Championship lead to eight points over the Brit, with Kimi Raikkonen taking the final spot on the podium. Brendon Hartley never got going after his FP3 crash, while Max Verstappen’s run of podiums ended after his RB14 got stuck in fourth gear in the final few laps. Sunday afternoon saw the running of the 2018 British Grand Prix at Silverstone. It was the eighth race around the current configuration of the ‘Arena’ circuit. For the first time in a long time, there was only one British driver at his home race, with Lewis Hamilton the only man flying the flag. 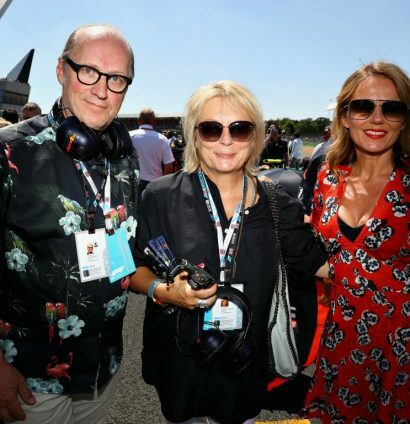 Ade Edmondson and Jennifer Saunders were invitees of the Red Bull team for the race, with Geri Horner showing them the ropes. There was also the small matter of a certain football match which happened straight after qualifying on Saturday, and the brass band visited the McLaren garage. And like the football, the glorious weather has come home as well, with the race being one of the hottest in British history. 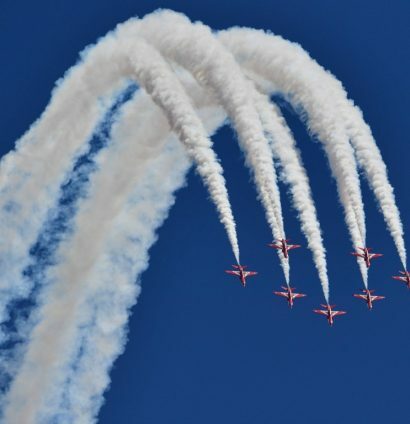 As always, the Red Arrows put on a show before the race. Only 17 cars started from the grid for the race, with Sergey Sirotkin and Lance Stroll all having started from the pit lane. Brendon Hartley’s Toro Rosso never made it to the grid. The start was terrible for Lewis Hamilton, who was spun round by Kimi Raikkonen, with the Brit dropping down to P18. The Finn received a ten-second penalty for causing a collision. One Ferrari hits the Mercedes, the other Ferrari takes the lead.. Hmm? Meanwhile, it was also a bad start for the two Haas drivers, with Kevin Magnussen and Romain Grosjean, who dropped from P7 and P8 to P10 and P14. Sergio Perez was also spun round on the opening lap and dropped to the back of the field. The Mexican almost collected one of the Williams as his Force India did a 180 across the pit lane exit. The other Force India was one of several cars overtaken by Hamilton in the first part of the race, as the reigning Champion was already up to P6 by Lap 11. How easy it was may have given some fans thoughts of Monaco.. And possible conspiracy theories..
Raikkonen was the first man to pit, also serving his ten second penalty, along with Fernando Alonso and Sergio Perez. Charles Leclerc was also one of the early pitters, and had to retire shortly after exiting. Elsewhere, there was a first appearance for the hard tyre in a race, with both Renault men having the ice blue coloured tyre fitted to their cars. Red Bull then chose to bring Daniel Ricciardo for a second stop, moving onto the soft tyres for the last twenty laps of the grand prix. Marcus Ericsson had a huge crash at Turn 1, spinning across the gravel and into the barriers. The incident brought out a Safety Car. During the SC period, both Ferraris and Max Verstappen pitted for a second time, while both Mercedes stayed out to gain track position. Bottas took the lead from Vettel, with Hamilton back up to P3 after being P18 on Lap 1. A week after securing Haas’ best ever finish (P4 in Austria), Romain Grosjean retired from the British Grand Prix, after tangling with Carlos Sainz at Copse. The incident brought about another Safety Car period. The two Safety Car periods brought the field together for a ten lap shootout at the end of the race, with Kimi Raikkonen overtaking Max Verstappen for P4. 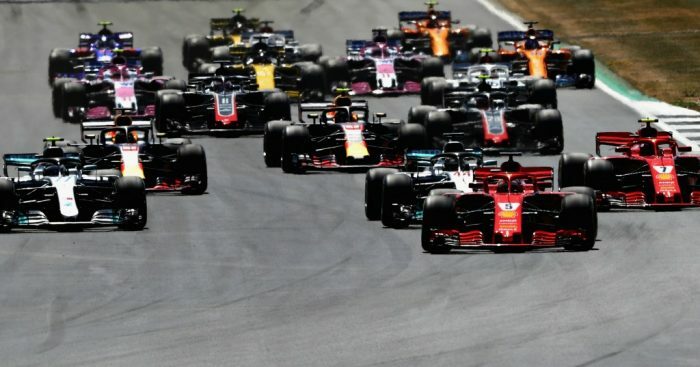 That overtake made it a four-horse race for the win, with the two Mercedes and two Ferraris going at it hammer and tongs, and it wasn’t just the fans who were loving it. We are entertained. Just saying. Sebastian Vettel got past Bottas to take the victory at Silverstone, with Lewis Hamilton and Kimi Raikkonen also getting ahead of the struggling Mercedes man to finish on the podium. Bottas finished ahead of Ricciardo, with Nico Hulkenberg taking P6 as the ‘best of the rest’. Esteban Ocon, Fernando Alonso, Kevin Magnussen and Pierre Gasly rounded out the top ten. Sebastian Vettel now leads the title race by eight points from Lewis Hamilton, while Ferrari now have a twenty point lead from Mercedes in the Constructors’. But he was interviewed on the podium at least.